The primary survey you will need to be concerned about is the Student Participation Survey, which records your attendance and participation in a course. 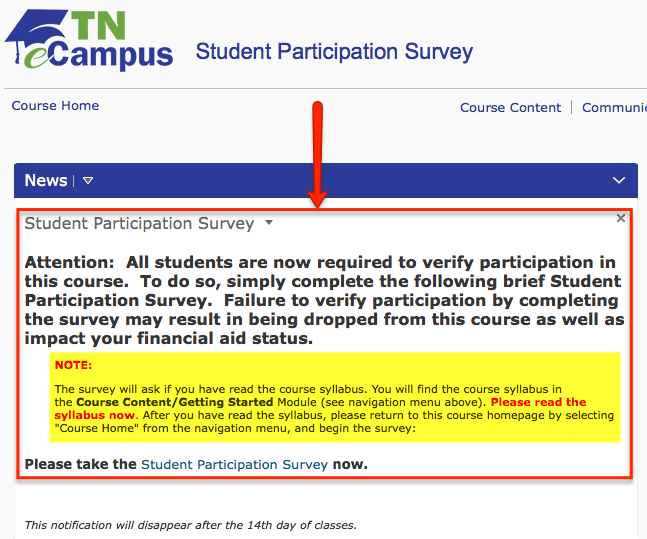 All students must verify participation in their TN eCampus course. To verify participation, log into your course at the beginning of the semester. Within your course the window shown below will appear. Click on the link inside the window to access and complete the Student Participation Survey. The survey must be completed within the first 14 days of the semester. Failure to complete the survey may result in an enrollment drop or potentially impact your financial aid status. Within your course, select the Surveys dropdown located under Course Tools in the main navigation bar to determine if you have completed the survey.